$13.75 & FREE Shipping on orders over $59. Do you have an empty fence or blank corner in your yard? Plant hops! Everything you could ever want to know about growing hops at home. Rhizomes (hop roots) are available once a year, usually during the first three months (January - March). Please do not order this book on the same order as hop rhizomes during the presale, as it will need to be split off the order due to us not having the rhizomes in stock. Thanks for the suggestion! 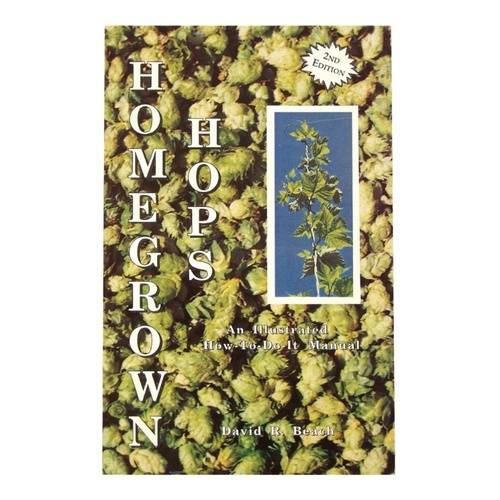 Looks like a good first book for growing hops at home. Always looking for more information about growing hops. Plan on growing my own hops. There is a lot of good information but how applicable it is...well you be the judge. Regardless of what everyone else says, I think this is a great book to get things started. The author has some great knowledge and history of hops. I'm on my third season of growing and my hop yard is pretty solid! There are many resources out there, but I'm 100% behind this product. Some logic but where;s the beef? As previously reviewed, the material seems pretty dated. Lots of folksy tidbits, but not much meat. I finished chapter after chapter wishing I had gotten more information, sometimes ANY information. Pictures were fuzzy and most were indiscernible. While not a waste of money, I hope someone writes a more comprehensive version. I liked the book, although there are some typos. Basic topics about hops. A little bit expensive for the information provided. Same as others have said, first thing I noticed was how dated some of the pictures are. What more can I say? Great info here. Must have for hop growers. a good starting book for the beginner. most of us will only grow a few of these little hop bines to use for one or more of our homebrew recipes. and this book can help you to achieve success at doing so. armed with this book and none other, I have successfully been growing hops for 5 years now! and every year the rewards are that much more. I highly recommend this book to anyone who would like to take there brewing to another level. As with the prior review, I have found quite a few typos. In addition, this book looks and feels like a little dated. Although it had some useful information in it, it was not what I expected. There are lots of typos and one of the chapters is even printed twice in different parts of the book. Would not recommend.